Führerhauptquartier ´Wolfsschlucht 2´ Laffaux, Soissons, France. 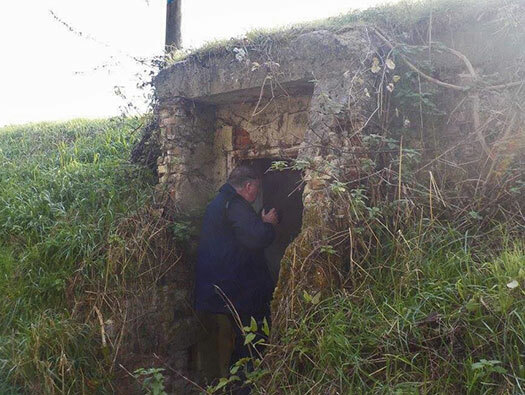 The defence and HQ is split into many defined areas, these are the bunkers that come under Â´LaffauxÂ´. We visited the ones marked in red. 15 x R501 Group shelter. 1 x R608 Battalion & Regimental HQ. 1 x KSR cable junction box. 1 x R110a Dreischartenturm (three embrasured turret). 3 x R621 Group shelter. 1 x R622 Twin group shelter. R608 Battalion & Regimental HQ. R98a a Westwall type bunker. In WW1 the German main advance came past here and down to the other side of Soissons. By 1917 the line had gradually been pushed back and French tanks were used up here on the plateaux. Then the Germans in July 1918 made a spectacular push back down almost to Soissons. 1918 and the French had to fight back all the way up here and beyond the plateaux. 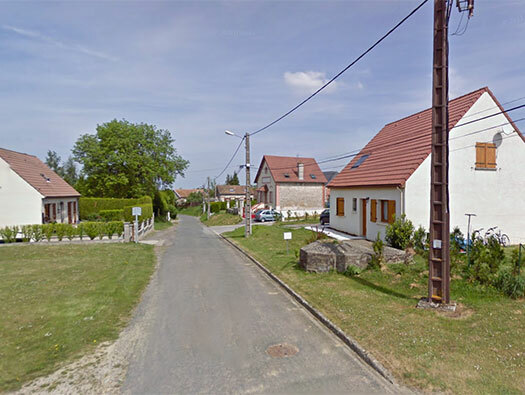 This area was also the left flank of the famous Chemins-des-Dames battlefield. Come WW2 and the Führerhauptquartiers is being built in the valley below here and the whole area is covered with command, defence, and living bunkers. Red line - German advance 1914. Blue line - German advance July 1918. Green square - the area was are in and Laffaux is at the red dot. Führerhauptquartier ´Wolfsschlucht 2´ Laffaux R621. The centre of Laffaux with the the Marie on the right and behind the trees an R621. The bunker has been built into the small town square as camouflage. One of the two entrances with the steel ladder. 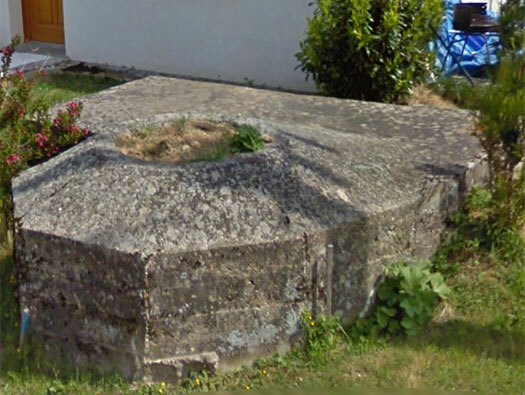 This seems to be an early design passed on from Westwall bunkers but was not carried on into the Atlantikwall types. Why it was done I cannot quite understand the need to climb the bunkers side to access the roof when just walking around it would get to the roof. The bunkers around here are a mix of Westwall and new Atlantikwall type bunkers. Here the Awall type R621 has a Tobruk added into the bunker design where as Westwall types did not use them like this. Bunkers Tobruk is really well camouflaged and low to the ground and gives the gunner a lot of protection. Führerhauptquartier ´Wolfsschlucht 2´ Laffaux R110a. Führerhauptquartier ´Wolfsschlucht 2´ Laffaux R110a Stand mit 3Shartenturm. 491P2 Gittertür (Screen Door) still in place with the close combat embrasure inside allowing a gun to be fired strait out of the entrance. 48P8 Close combat defence embrasure. 78P9 plate with two vents, one 100mm and one 200mm. 78P9 plate with two small viewing slits either side and the machine gun in the middle. Two 100mm vents either side set into the concrete these were to vent out the gun room. Führerhauptquartier ´Wolfsschlucht 2´ Laffaux R110a Stand mit 3Shartenturm 407P9. Two embrasures, viewing slit and concrete and stone camouflage still in place. The gun Lafette set in place but no M.G. Looking into the Schartenturm with the metal deck where the gunner would stand and the entrance at the back. Looking up at the roof of the dome. The different colours were the different segments of the compass also note the figure 2 marked on the dome. Compass colours in the dome of a bunker. The bunker and dome inside showing the Lafette fitting slots.. The machine gun and Lafette in use. The same sort of view in Alderney. The bunker and dome in the field. The angles the gun could cover. Walking across to the next set of bunkers. The next set of bunkers. Führerhauptquartier ´Wolfsschlucht 2´ Laffaux 58c Tobruk No.757.B. Führerhauptquartier ´Wolfsschlucht 2´ Laffaux Tobruk No.757.B. Where the Tobruk could cover. Can also be used in air defence role. Tobruk, how to enter and also to get out. Me, leave it to the youngsters. Moving on down the bank. Führerhauptquartier ´Wolfsschlucht 2´ Laffaux No.757 R98a M.G. Schartenstand. R98a M.G. Schartenstand, a free standing machine gun bunker. The ´a´ suffix means its in its normal (right hand) design and ´b´ means it is flipped (to left hand). A large embrasure for a machine gun. These are two 100mm plates bolted together to give 200mm thickness. An inner 7P7 and a 726P3 on the outside. 7P7 plate type used inside. Walking into the R98a. The hook on the left is for the 491P2 Gittertür (Screen Door). Further down are niches for light switches. R98a M.G. Schartenstands No.757. plan. Führerhauptquartier ´Wolfsschlucht 2´ Laffaux R98a M.G. Schartenstand No.757..
Vor Einschalten des Motors Lüfter durch einige Umdrehngen mit der Kurbel betätigen - Before turning on the engine, operate the fan with a few turns. 7P7 plate at the back and a 726P3 on the outside. Note the vision slit on the left side. 144 Schartenlafetten kein. The type of machine gun fitting here. The table the machine gun would have stood..
Gasket for the vision slit. Screw threads to hold the plate on. All now removed I am afraid. Ammunition niche for ammunition boxes. These bunkers could hold thousands of rounds of ammunition. Führerhauptquartier ´Wolfsschlucht 2´ Laffaux R98a M.G. Schartenstand No.757. Cable duct to a phone and a hole for spent machine gun ammunition. No.757 the bunkers number on the wall.. Taking a well earnt rest at the war memorial. The WW1 the battle field moved too and fro over these hills. These are the routes Schneider tanks took in 1917 during one of the French advances. Führerhauptquartier ´Wolfsschlucht 2´ Laffaux Kabelschaltraum. Kabelschaltraum Cable compartment set into the side of the road where main telephone lines passed through. The terrible photographer stood in the door way where a 19P7 gas tight door would have been. Inside where the cable junction boxes would have been. French army barracks transport building. 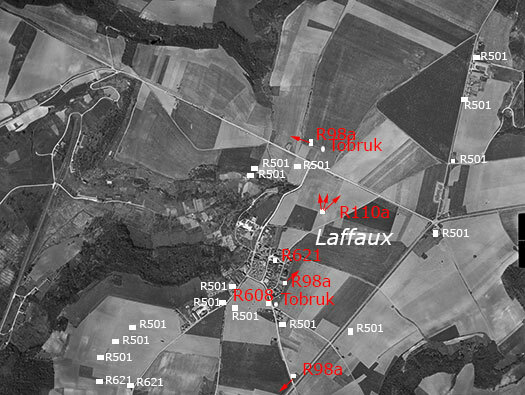 Around the area of the r/h R501 is situated there is a French army camp. It was not there in the 1949 photo. 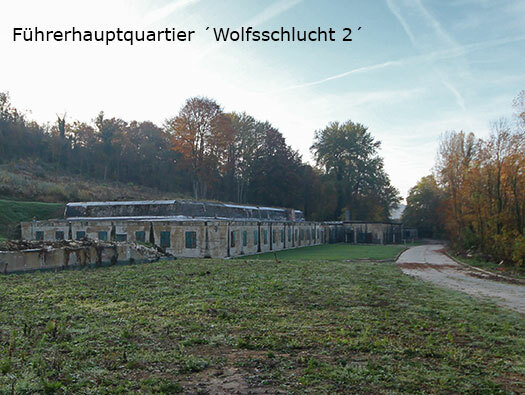 Führerhauptquartier ´Wolfsschlucht 2´ Laffaux 495 R608 Battalion & Regimental HQ. Outside the R608 Battallion & Regimental HQ. 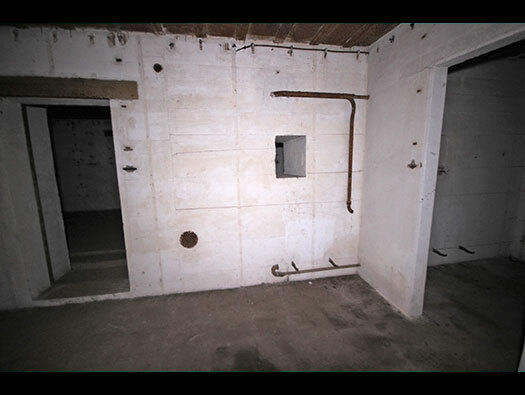 There were four R608's surrounding the FHQ for individual Regimental HQ's bunkers and one inside the FHQ. This is quite a large bunker with many rooms. The entrance with a 491P2 Gittertür (Screen Door) and a close combat defence embrasure down the stairs. Set in the niche was a relay box for a telephone. 139/495 I believe 495 is the bunkers number. They may have been re numbered as several bunkers have two numbers?? Basically, when gas alarm is called, close all doors marked with a red ring. The red ring on the doors meaning they are gas tight seals. You can just see the red ring on this door. A gas tight rubber seal runs all around the doors and a gasket is fitted to the doors window shutter. 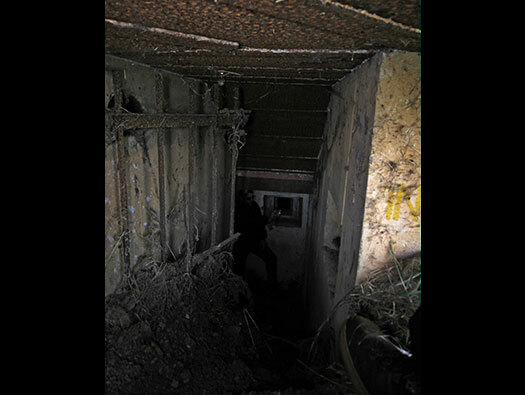 Close combat embrasure in the close combat room. Bef brennendem Licht Scharte schliessen = Close the burning light - Close when light is on. It looks a 48P8 embrasure. Schnellschlus sklappe nur beim Schiessen öffnen = Open the quick release only when shooting. Close combat defence room covering the entrances. A double 434PO1 door designed so that if rubble stops the bottom door from opening, the top one can be and you can then escape. Plan, yellow arrow showing how its machine gun could cover the whole rear area. The door is a 19P7 and you can see the rubber seal that goes around the door to make it a gas tight seal and on the floor a trench to run water pipes, electric cables and communications cables. The 19P7 showing its rubber seal and glass viewing window and two door locks. Ventilation room where two sets of air pumps could be used. Ventilation room showing some of the air pipes still in place. Ventilation room with the fittings on the wall for the two units. Bei Schutzluftung gas offnen = In case of protective ventilation open the gas. Vor Einschalten des Motors Lüfter durch einige Umdrehungen mit der Kurbel betätigen = Before switching on the engine, operate the airer with the crank by means of several revolutions. Ouistreham Grand Bunker very like the set that would have been here. 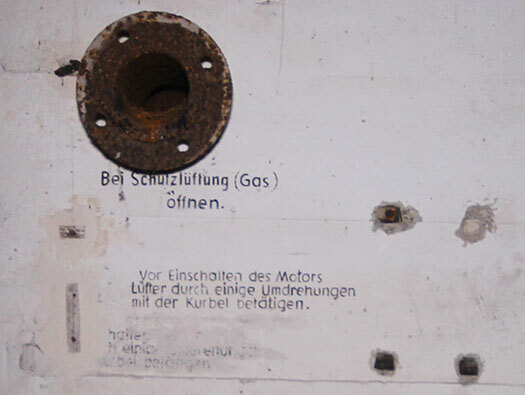 Bei Schutzlüftung (Gas) öffnen = Open with protective ventilation (gas). (I cannot see the other wording). Note the brackets on the wall for heating radiators. 422p01 close combat defence embrasure covering the entrance. 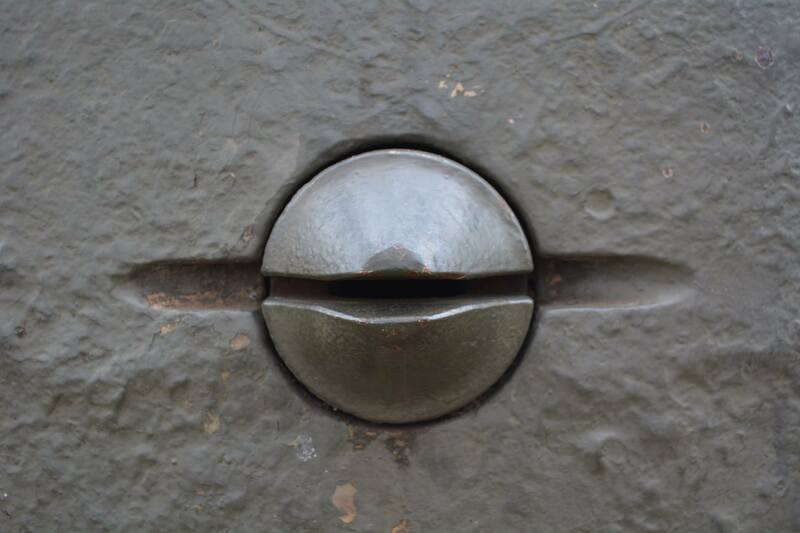 422p01 close combat defence embrasure. 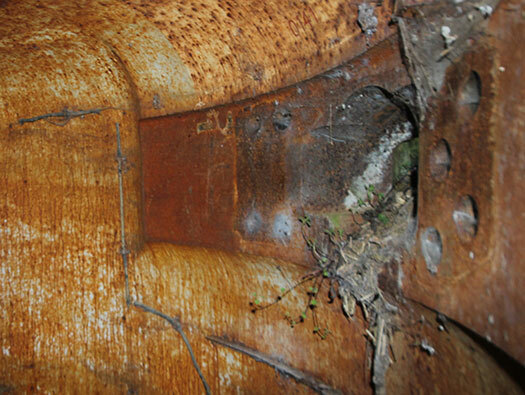 Close combat defence embrasure covering the entrance. There were several fittings on the wall. The sort of fittings that could have been used here. Bunk fittings on the wall. Slots into the store room. (Although these rooms are named on the plan, they may have been used for other uses). Second - Chart plotting room. First - Chart plotting room. Radiator fitting on the wall and a vent in the wall. Left - Non-commissioned Officers room. Right - Chart & plotting room. Two radiator fittings and hot water pipe dropping down the wall.. Chart & Plotting room, Store Room..
You can only wonder what was in here. Radio (Funk) room close combat defence covering the second entrance. The second entrance. 495 on the wall. Gas lock & second entrance with the remains of marks showing where a field telephone was fitted. 434PO1 door note the red circle for gas door. The route out and yes I just managed it. An old telephone junction box in a niche like the one here. Führerhauptquartier ´Wolfsschlucht 2´ Laffaux Tobruk. Tobruk. This is just up the road from the last bunker. This one has a heavier machine gun possibly an M.G.09. 101a a larger size than the more standard 58c. This one can hold a crew of two men, with bunks and a stove. A bit like home from home. The machine gun would be any type that was available, usually an M.G.34 and here at FHQ I believe they used shields. They would have a wooden door to close off the Tobruk and a lid of maybe a steel or concrete lid. Model of a 101a Tobruk. Führerhauptquartier ´Wolfsschlucht 2´ Laffaux R98a. M.G. - Schartenstand type R98a, this one is designed to fit into a town scape and has sharp squared off edges, where as if it was used in the country a more rounded effect would be used. How the inside may have looked. Two metal plates bolted together a 7P7 & a 726P3 with a vision slit and a gun embrasure. Walking back past the church as I mentioned earlier has a lot of bullet scars, I am not sure if its pre WW1 or not but the French Marine Battalion launched an attack across the fields to the right to attack the German front line in 1917 and then the French had to do it all over again in 1918 due to a devastating German advance that wiped out all French gains. French soldiers in chalk quarries. You can just make out the odd bullet scrape. One other interesting item about the church is that the church clock glows blue and shines out all around the countryside like a beacon. A lovely thought. The last R98a in the group around Laffaux sits right next to the grave yard and covers any advances up the now N2. sitting next to the cemetery.